This is a rendering of Skanska’s proposed Capitol Tower, designed by Gensler. HOUSTON – Skanska USA erected a construction crane in downtown Houston over the weekend, a sign that the firm expects to begin construction soon on an office tower, according to a report in the Houston Chronicle. Several years ago, Skanska announced plans to build a 35-story office tower on the site, a block bounded by Capitol, Rusk, Milam and Travis streets. The foundation for the new tower was poured in August 2015. But a sudden downturn in the energy industry derailed those plans as vacancy soared in the Houston office market. Skanska’s office proposed office building, a 750,000-SF project called the Capitol Tower was thought to be on the back burner. But last fall, Skanska engaged the CBRE real estate firm to find tenants. Recently months, reports have circulated that Bank of America has been negotiating to lease more than 200,000 SF in Capitol Tower, which should be enough for Skanska to start construction on top of the foundation it poured in 2015. 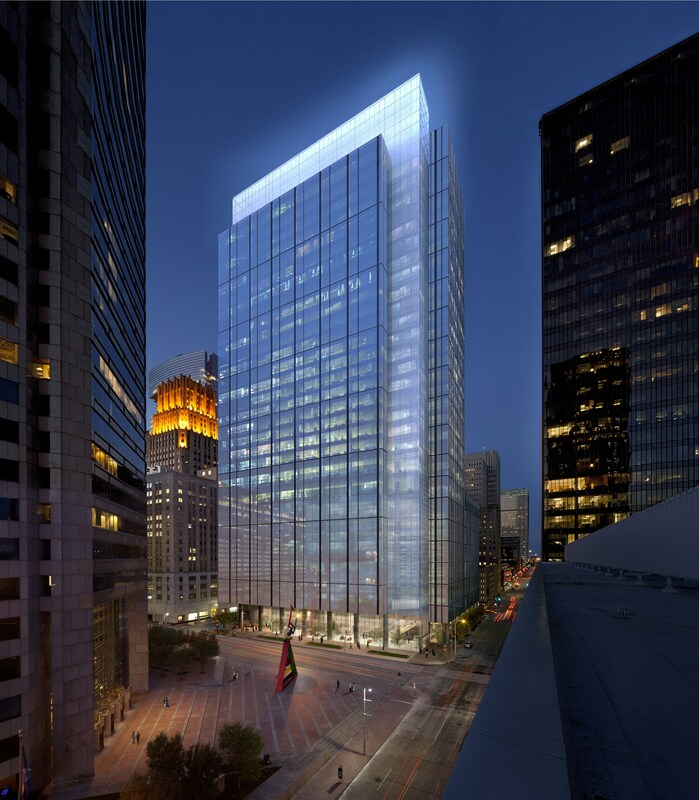 Skanska and Bank of America – which will leave downtown’s Bank of America Center, 700 Louisiana, if the deal goes through – have declined to comment on the pending lease. But the appearance of the construction crane could mean Bank of America – or another major tenant – has signed a lease and vertical construction may start soon. “The mobilization of equipment at the Capitol Tower site signals our optimism that the marketplace will present new opportunities for the project as we move through 2017,” Skanska USA spokeswoman Beth Miller told Katherine Feser of the Houston Chronicle. Skanska’s confidence comes in the face of negative statistics about the Houston office market. Houston has the highest office vacancy rate (21.5 percent) in the nation, according to a recent report by Marcus & Millichap. And CBRE reports Houston leads the nation in sublease office supply – over 11 million SF. But Skanska marches to the beat of a different drummer, compared to others in the real estate development band. Skanska USA, an arm of a huge global construction organization based in Sweden, typically finances its projects internally with Skanska corporate funds. In an interview with Realty News Report earlier this year, Matt Damborsky, executive vice president of Skanska USA Commercial Development’s Houston office, said Skanska was actively advancing the downtown project. Skanska demonstrates the ability to be patient. 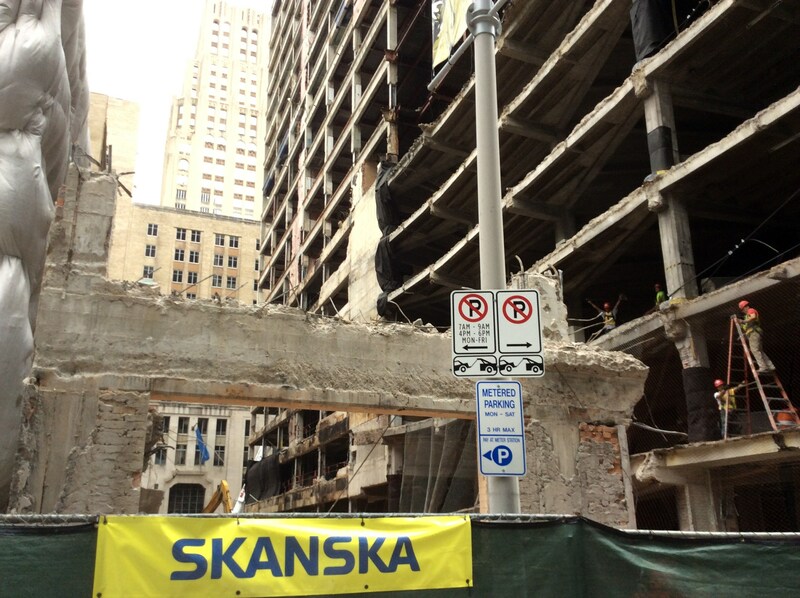 In October of 2014, the 18-story Houston Club building was demolished to make room for Skanska’s new skyscraper. Then the foundation for Capitol Tower was poured in August 2015. But the waiting may be over soon.